The M&S Hand Cooked range feature a 1950s retro look.The basic drawings to represent the flavourings are similarly vintage. The bags are flavour colour coded, which in turn causes the darker bags' black writing to get a little lost. The writing itself has a sort of stamped feel. This design would have been cutting edge at the time of Queen Elizabeth's coronation, but aside from its shelf stand out properties, it is just a bit old fashioned for a modern market. The Hand Cooked selling point does nothing to help it. There was a particularly crispy snap when the first bite was taken. 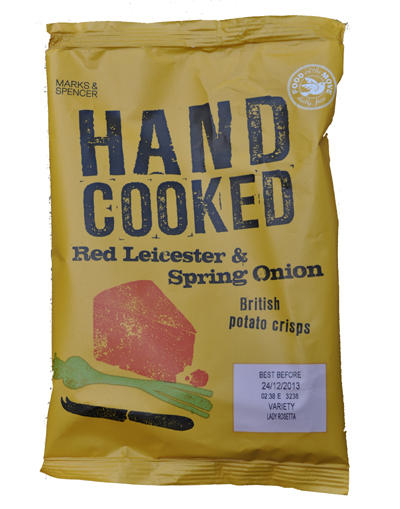 After this the Crisp deteriorated at just about the right rate for a Hand-Cooked Crisps style of potato slice. Unlike regular Crisps, which often smash up and turn to mush very quickly, these sustained their crunch till virtually the end of the munch process. There were lots of curly and odd shaped Crisps, and even some stuck together. There was also a large amount of visible potato skin on the edges. There were green flecks mixed in with the light orange coloured seasoning. A Nose Plunge Test revealed an odd aroma - it was like an empty box that someone had put cheese in, but had taken it out again a week before the box was sniffed. Fortunately the Crisps did not taste of empty box. Unfortunately, they did not taste too much like Cheese & Onion either. There was a mild Cheese & Onion, but it wasn't Spring Onion, it was more generic than that. The Cheese was mild enough to be Red Leicester, but again, it was like a very creamy and barely noticeable generic Cheese.